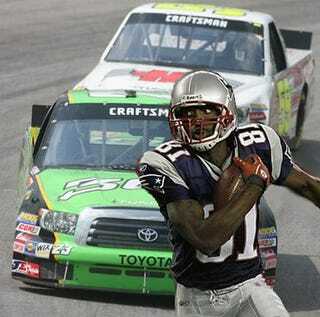 Randy Moss, the man who combined with Tom Brady to give us quite the fantasy football season last year (and, apparently, helped take the Patriots to the Super Bowl), is going to be starting a NASCAR Craftsman Truck Series team. Fox Sports is reporting that Moss hopes to get the team running in races later this year in advance of a full 2009 season. At the moment he lacks a manufacturer, a driver and a sponsor. But he's Randy Moss, so that doesn't much matter. Plus, if Dan Marino and Troy Aikman can do it why can't he? "There are a lot of NASCAR fans in the locker room," Moss said in a statement released Tuesday. "We've seen a lot of football players get involved — guys like Dan Marino and Troy Aikman, to name a couple. I think it's a good fit and gives some of the companies I am already working with an additional outlet. It's a smart move on the marketing side of things, but on the personal side of things, I think it's going to be a lot of fun."